Sod webworms are a lawn pest that feed on all types of grass leaving brown spots (and headaches for homeowners) in their wake. The larvae are about 3/4 of an inch to an inch long and their coloring ranges from brown to green with dark spots. They infest turf grasses all over the United States so no matter which state you’re in, these little guys should be something to look out for. They are particularly fond of cool-season grasses like fine fescue, Kentucky bluegrass, and bentgrass so if you live in an area where these grasses are commonly used, pay particular attention to damage that could be from sod webworms before you wind up with an infestation. So what are the signs that these pests have made your lawn their home? The most obvious sign and irritable part of having sod webworms present in your turf is having brown or yellow spots. The spots generally start off relatively small but can spread, forming larger areas of damage. 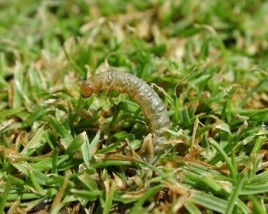 The larvae chew off leaves and stems of grass and are particularly harmful in weakened and stressed out lawns. The most damage is usually done during the summer months when brown spots are assumed to be caused by drought stress and the grass is more vulnerable. Another sign that you have a sod webworm problem is the presence of the adult moths which are whitish to light gray or tan in color. They’re usually seen flying a few feet above the grass when disturbed (have you ever seen these insects flying up when you’re walking through your grass?). Seeing moths alone does not mean you have a problem with their larvae though so verify the source of your brown spots before doing a treatment for sod webworms. If you’re still not sure that webworms are invading your lawn, use a soap drench to irritate the larvae. Mix about 2 tablespoons of liquid dishwashing detergent with 2 gallons of water. Sprinkle the soap drench over a square yard of the lawn where you suspect sod webworm damage. Within a few minutes, you should see the larvae climbing to the surface. 10 to 15 larvae within a square yard signal treatment is needed. If you have a lawn care service, you can avoid the headache of trying to play detective altogether by having someone come out to check for you. Proper lawn care techniques will help to make your grass more resilient aiding in quick recovery from larval damage so keep your grass fertilized, mowed high, and hydrated. If you find that you have a sod webworm infestation, insecticide applications have been shown to easily control the larvae. Try to identify webworm problems early on though before your grass goes from being damaged to dead.